When I was in culinary school, I worked at a Mexican restaurant called Casa del Sol (Spanish for Casa "of" Sol). 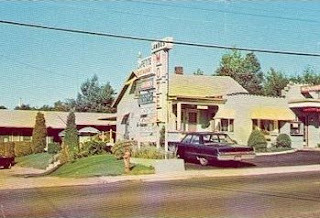 I was a line cook, but on weekends the owner let me get some extra hours working behind the bar on the restaurants outdoor patio (you can see the umbrella in the old photo below). I didn’t have any bartending experience, but luckily 95% of the orders were for beer, simple mixed drinks, and the Casa del Sol's famous margarita. The food was very, very good - the owner had actually sent the chef down to Mexico for a month before opening to taste the real thing - but, the restaurant's claim to fame was its perfectly concocted margarita. Like many bars that feature the margarita as the signature drink, the recipe was a secret. Not only was the recipe a secret, but the owner, Harry Tucker, would make the mixture across the street in his home, and carry over a bucket to the bar when needed. It was quite a show (done intentionally, no doubt) - we would "run out" of margarita mix, and everyone would sit, wait, and watch, as the mix-master himself walked across the street to return a few minutes later with a 5-gallon bucket of his secret potion. Sloppy clapping and drunken hoots of joy would fill the air. Good times. 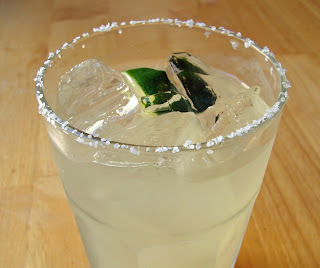 Here is my "secret recipe" for margaritas, presented in a video recipe I recently did for About.com. Remember, I can't embed the video, so when you click on the video, a new window will open. Enjoy! These are always good during the hot summer months, or when eating Mexican food, but today it's raining... It's May Day and it's raining... Maybe by Cinco de Mayo this recipe video will seem more appealing. The gloomy skies are making me feel depressed. Maybe I need to mix up some of your Margaitas and put on Mariachi music. Somewhere it's four in the afternoon... and it's sunny. Gringos visiting Mexico often order Margaritas without ice... you know what they say about the water there, and besides, you get a heftier drink when the glass hasn't been filled with a cup of cubes. Mmmm, warm Margaritas and Hot Tamales! Viva la Mexico! "Cinco de Mayo is on the fifth this year" (audio on youtube). The most welcomed ingredient you include in your recipes is your humor; a sweetener which contains no calories. Crushed, frozen, raw tuna in a paper cone; anyone ever had sushi slushi ? When I was in Mexico this past March, a group of us were in this little bar we go to every year. It's kind of American central for this little town in the mountains. The owner, Raffa, is very cool, and loves us, and our money :-) Anyway, during the last night of the festival, the power had been out almost all day. Even the beer drinkers, with lack of cold beverages, were switching to margaritas. At one point, near the end of the night, Raffa started teaching his 7 year old son Rodrigo how to make Margaritas. Everyone wanted a Rodrigo Margarita! He had a heck of a time squeezing the limes, but he got it done. Raffa was so proud his son was slinging drinks, it was very cool in a south-of-the-border kind of way! I look forward to trying your recipe on my family next month :-) It's offshore tourney season, and I always get to cook at the fish fries. When you get to watch a parent, genuinely showing pride in their children's efforts, and not just BS-ing to make little Johnny's ego "feel good," it's a real treat. Parents South of the border do a much better job of being genuine with their kids than stateside' hockey moms and dads. Keep that look in your back pocket Pyrofish, and share it with your kid someday. @ Anonimus: "What is the salt around the rim for? I don't get it. Please explain. Thanks~!! And the cocktail looks really nice. Too bad I'm too young to drink =X"
some other cocktails (sweet ones) use sugar for that..
A couple of these and you'll forget all about how you contracted your swine flu. ironically, the hangover shares many of the same symptoms. Now I won't have to go blow my dough in a bar for a good 'rita - thanks, Chef John! I like Grand Marnier in my margaritas. Can I just replace the Triple Sec with Grand Marnier and leave everything else the same? Thanks!! this was super easy! i'd never really ventured into the world of making cocktails, and my to-be-inlaws seemed to have loved the results. nice! This would be perfect for washing down a perfect chicken roulade. Speaking of which, any news from about.com when that video recipe may be airing? 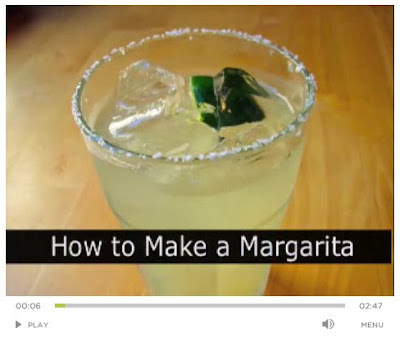 Chef, what's the name of the song you have on your youtube video for the margarita video? It's very relaxing. it's called "Buddy" it's a free sound clip that comes with iMovie. I've been drinking Margarita's all week (work, work, work), trying to find the perfect formula for an upcoming party. I started with yours, then tried others. What tastes best to me is 3 parts blanco tequilla, 2 parts fresh lime juice, 2 parts simple syrup (great idea, btw), 1/2 part Cointreau. I like the balance between the lime juice and sugar, with the orange liquor more of a subtle background taste. This is almost identical to a Rick Bayless concoction in his cookbook RB's Mexican Kitchen. You'll have to drink two margaritas to find out how they compare (darn! ), but that's the cost of relying on the scientific method. I'm a little late to the party here, but we were lamenting that the pre-bottled margarita we were buying was awful and overpriced and wondering what the secret to the real-deal margaritas we had in Mexico was. Well, leave it to our favorite chef! These are perfectly delicious. There's no going back now. One note: We were almost out of triple sec but had most of a bottle of Blue Curacao so I gave it a try instead. Wonderful. Besides the beautiful sapphire color it makes a slightly less sweet cocktail and adds just a kiss of bitterness and balance. Oh great, just what i needed- a new mix to try. good thing i love research...LOL. I will try this Chef, it looks compelling. i have stuck with one very simple mix for quite awhile now. i like to stick closely to the classic version. Many, many different ways as i'm sure most Margarita lovers know. using cheap tequila?...may as well get out the blender and use warm ice to make a slushy. the only triple sec even worth considering is BOLS. Cointreau is the best and Patron Citronge next best. i think Grand Marnier could be used as a last resort but i would move to beer myself. i think mexican lime juice adds a distinct quality that persian limes cannot match. 3 Oz. Don Julio white. 1 Oz. fresh mexican lime juice (Key limes). pour into a pint beer glass full of ice- done, no salt for me, thanks!! !